The Irish Pro Continental squad will end after just two seasons in the peloton. FLORENCE, Italy (VN) — Larry Warbasse stopped along France’s Côte d’Azur because he thought Philippe Gilbert was messaging him about their planned training ride. Instead, he learned Monday morning that his Aqua Blue Sport team was folding and he needed to search for a new job. The 2017 U.S. champion signed with the Irish Pro Continental team when it began in 2017. The squad announces via Twitter that it would not continue past 2018, leaving its 16-man roster and staff searching for work for the next year. “I have had just about as much time to digest it as you have,” Warbasse told VeloNews on the telephone from his base in Nice, France. “I went for a ride this morning, to meet Philippe Gilbert. I get a message, I thought it was Philippe. Then I saw the team is stopping from a message from one of my teammates. So I started firing off texts and e-mails. Looking out over the Mediterranean Sea from Villefranche, Warbasse could see cycling’s tides changing quickly. He began messaging back and forth with his agent to line up a new team for 2019. Warbasse has raced at the top level since 2013, first with BMC Racing. It is not the first time he has been in this situation, as he was forced to find a team when IAM Cycling closed at the end of 2016. The 2017 season went well for the 28-year-old. 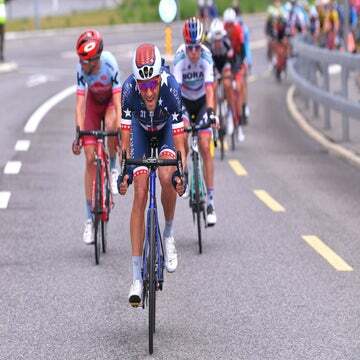 He won a stage in the Tour de Suisse and the national road championship title. With his talent and experience, he should be able to land a new job. The rest of the team is searching too. That includes three Irish riders and four Brits, including Adam Blythe. Also on the roster is Austrian Stefan Denifl, who won one of the big mountain stages to Los Machucos in the 2017 Vuelta a España, the team’s first grand tour appearance. “We started this project over two years ago with huge ambition, gusto and optimism that we could actually make a difference,” read the team’s statement. “This year we have found it increasingly difficult to obtain race invitations and recognition from race organizers in how unique and how well supported our project should be. The invitations to grand tours, big stage races, and classics were fewer in 2018. From the outside, followers could see problems were brewing. Owner Rick Delaney tried to negotiate a merger or a fusion with Nick Nuyens’s Veranda’s Willems-Crelan team, which has Belgian Wout van Aert on its roster. However, that deal failed and the team needed money. Without options, Delaney pulled the plug. Delaney began with a unique model for a cycling team, funding via an online sports store based around Amazon. He wanted the team to be free of short sponsorship contracts that saw teams like HTC-Highroad and Liquigas in danger of closure. “He had a cool idea,” Warbasse added. “I think it was slow to take off, and not maybe not making a ton of money yet. “There was the news of a potential merger or take over. That didn’t go as planned, and that led to this. It’s disappointing. It’s cycling and I don’t think it’s the biggest surprise to see things happening like this. It’s seems like a regular occurrence now.